Is Meat Consumption Compatible With Christianity? There are many compelling reasons for considering a vegetarian diet. There are the health considerations: A vegetarian diet tends to correspond closely with current dietary advice for healthful eating. Vegetarians are, on average, healthier than those who consume the typical Western diet and enjoy a lower incidence of heart disease, diabetes, obesity and diet related cancer. There are the environmental considerations: Pollution, global warming and deforestation can all be linked to livestock farming. Since 1970, cattlemen have destroyed 20 million hectares of rainforest and produced 1.4 billion tons of carbon dioxide. There are the humanitarian considerations: It takes ten kilos of vegetable protein to produce just one kilo of meat. Resources wasted in meat production could be channelled into establishing viable grain distribution networks. It’s officially estimated that should Westerners reduce their meat consumption by as little as 10% that would free enough land, water and energy to adequately feed at least forty million starving people. Compelling reasons indeed to eliminate, or at least drastically reduce, meat consumption. However, the intention here is to explore a further consideration. Whether in fact vegetarianism is a Christian obligation. Let’s return to the central question: Is meat consumption compatible with Christianity? A provocative question no doubt. Nevertheless, considering that there exists no honest means of reconciling the routine violence of the meat industry with the inherent Christian ethos of non-violence expressed through mercy and compassion, a wholly legitimate one. Each year millions of defenceless animals are mutilated before being butchered. Lambs are castrated, piglets tail-docked and hens and turkeys de-beaked nearly always without anaesthetic. Even the most superficial investigation into the meat industry would expose disturbing evidence of cruelty and violence. No Christian could possibly condone, not to mention perpetuate, the suffering inflicted upon those condemned to the factory farm and/or slaughterhouse. It’s all too easy to turn a blind eye to suffering when it is neither we nor our families who suffer. Nevertheless, lest we forget, Christ implores us to alleviate suffering, regardless of the sufferer. Where there is suffering there is Christ too, amid the misery and pain: "I was hungry...thirsty...a stranger...naked". As we do unto the least we do unto Him. No Christian can dispute the fact that scripturally, humanity has God-given dominion over non-human species. However, nailed to the Cross, Christ demonstrably redefined our definition of dominion. No longer would dominion be so readily equated with oppression or exploitation of the vulnerable. Christian dominion, exemplified by Christ, would be defined by service. Not symbolic service motivated by self-interest, but self-sacrificing service motivated by genuine love and compassion for all. Indeed, the Passion bears witness that Christ’s love, which Christians are called to emulate, knows no bounds. In contrast, the meat industry is based upon an un-Christian definition of dominion: oppressing, exploiting and butchering the vulnerable simply to indulge an unhealthy lust for their flesh. 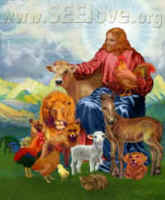 Standing firmly against cruelty and violence, vegetarianism provides Christians with the practical means of fulfilling Christ’s call for greater mercy and compassion as opposed to meat consumption, which perpetuates an industry no more compatible with Christianity than murder, slavery, child exploitation or female inequality. Christ, the Lamb of God, brings us a new kind of flesh and a new kind of blood. Christ offers us His flesh and His blood; the flesh and blood of self-sacrifice and Perfect Love. Christians are duty-bound not to corrupt the sacred flesh and blood of Jesus Christ with the flesh and blood of cruelty and violence. We can live healthy lives without perpetuating the horrors of the meat industry. At the dawn of the new millennium let’s bring Isaiah’s vision of Christ’s peaceable kingdom, where the wolf dwells with the lamb and all creation lives in harmony, a step closer. Let us say "no" to the slaughterhouse and "yes" to the Lamb of God, Jesus Christ.